(l-r) Scott Lang/Ant-Man (Paul Rudd) and Hank Pym/Ant-Man (Michael Douglas) in MARVEL’S ANT-MAN. ©Marvel. CR: Zade Rosenthal. Now 46, Rudd has established himself as a leading man, mostly in comedies including “Anchorman: The Legend of Ron Burgundy,” “Dinner For Schmucks” and “This is 40.” Adding to his every-growing list of credits, he now plays his first-ever superhero character, Ant-Man, in the eponymously titled Marvel movie. Married, with two young children. Rudd says playing a superhero has scored him some major brownie points at home. The Passaic, N.J., native recently spoke at a press conference about tackling the micro-sized hero role, getting into character and staying cool, both figuratively and literally. Q: What was it about the character and the opportunity this film afforded that excited you? Rudd: There was a lot, but the first thing was that it is a Marvel movie, and the fact that it was different than anything that I’d ever done. I liked the challenge. I thought it would be an exciting adventure, and I enjoyed the fact that when I was cast people went, “Huh, really?” You wouldn’t necessarily think that (I’d be cast). Marvel likes to (make unexpected casting choices) and I was thrilled to have the opportunity. Q: How did you prepare the role? Did you go back to the source material? Was it all in the script? Were you a fan of the character before? Rudd: Growing up, I really didn’t know the character. Before we ever started shooting, I read the comics and I tried to do a little bit of research, and then just kind of got into the mindset (of the character) as much as possible. There was also all of the physical stuff that I wanted to throw myself into, to feel as if I could play the part and not only be convincing but just help me feel the part more. Q: Did you enjoy being ripped? Rudd: I enjoyed being able to do shoulder rolls and flips for the first time. I was very self-conscious during that day of shooting. 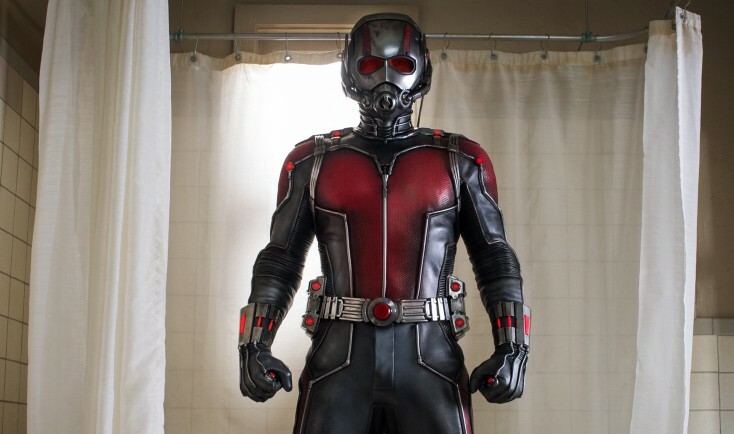 Q: Your “Ant-Man” co-star David Dastmalchian says he remembers what you had for lunch the day when they shot your abs. You had one almond. Rudd: And I felt so bloated. Q: Your 9-year old son, Jack, has said that he thought you weren’t that cool when it was first announced that you were going to play Ant-Man. Has he seen the completed movie yet and have you redeemed yourself? Rudd: There was nothing to redeem. My kid more than anything likes to make me laugh, so when I told him that—even at 9 years old, he has such a funny sense of humor—that’s what he said, but this is the first thing I’ve ever done, ever, that he is legitimately jazzed about. He can see it. His friends know about it. We were at Disneyland two days ago where they were having kind of a sneak preview. I was sitting next to him, and to see as a parent the look on my kid’s face when he’s watching this I’ll never forget it. It’s like as soon as it ended he just looked at me and said, “That’s awesome!” And every time a commercial is on, he’s like, “Dad, Dad, Dad!” He’s so excited. I’ve never experienced that, and so it’s so cool to be able to share this with my own family, and especially my son. Q: When this movie opens it’ll be almost 20 years to the date since you starred in “Clueless.” Does it feel like that much time has passed? Rudd: (laughing) Oh, my God. Sorry. I have gratitude and am so appreciative that I’ve been able to continue to work doing something that I love, and not only doing something that I love but working on movies that I’ve loved. I always try and keep that kind of saying: I want to work on things that I would want to see. For a large part of my career, the vast majority, that’s been true, and I’m just very, very appreciative of that. Rudd: (smiling) I know, it’s crazy. I fell in love with me. It’s unbelievable, isn’t it? Q: Was it comfortable wearing the Ant-Man suit? How much did you have to slim down, or what food did you have to give up in order to fit into those suits? just basically eliminate anything fun for about a year, and that’s a good way to prepare to play a superhero. It also helped me feel the part. Q: If Ant-Man could be the Jiminy Cricket to any of the Avengers characters, who would it be and what would you advise them to do as their conscience? 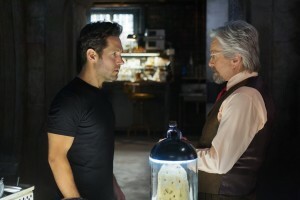 Rudd: There’s the physical side that you would think the Hulk, but also Scott Lang shares a passion for science and technology that Tony Stark has. He also has very specific feelings toward (the Avengers) as a whole because he’s learning a little bit about them. He’s aware of their presence from Hank Pym, who has very specific opinions, but I think I’d say Hulk. Q: The fact that you have this father-daughter storyline in the film, did that give you another level to play with this character? amazing effects, and this certainly has that, and brilliant visuals, a lot of action, humor, whatever, but whenever you see something that you can connect to, that’s emotionally resonant, it stays with you in a very different way. That’s the key to any movie and that’s what I thought about throughout this whole film. This is what the movie is about.